My beloved iMac appears to be dying. It keeps showing me the spinning umbrella. I am very sad. No wait, does this mean that I can get a brand new iMac with a screen so big that I will go blind watching the new Star Wars trailer?! P.S. No seriously, my computer is dying and I have to get a new one – regular programming will resume as soon as my new computer is delivered. It’s Travel Thursday and we’re blogging over at Owl Fly Away today! It was a cold and foggy morning in the Smokies, and the weather forecast called for rain, so we decided to take a drive round Cades Cove instead of attempting to drag the children on a wet hike in the mountains. Cades Cove is a wide valley surrounded by mountains, which was home to Cherokee and European settlers before the founding of the national park, and is currently one of the best places to go wildlife spotting. The road through Cades Cove is an 11 mile one-way loop which takes you around the most scenic parts of the valley. Driving slowly, it takes about four hours to complete the whole loop, including stopping off to explore the well-preserved historic buildings. Midweek Break: Chris Haughton is coming to town! 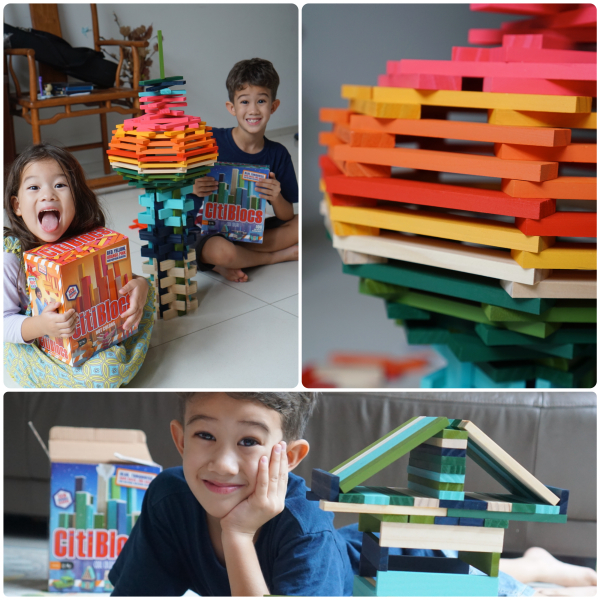 As I said earlier this week, I am really stoked about the family-friendly events coming up over the next two weekends at the Singapore Writers Festival – and I am especially excited that Chris Haughton, author-illustrator of one of our favourite children’s books, A Bit Lost, will be in town and conducting workshops during the festival! Chris Haughton is conducting a grand total of four workshops, and two of these are ticketed events aimed at families with children between 4-6 years and 7-9 years of age. The first workshop, Animation On A Phone, is for families with children ages 7-9 years old. During this workshop, Chris Haughton will go through some basic illustration steps and teach kids how to create a stop-motion animation creation with help from the Vine App and a smartphone. 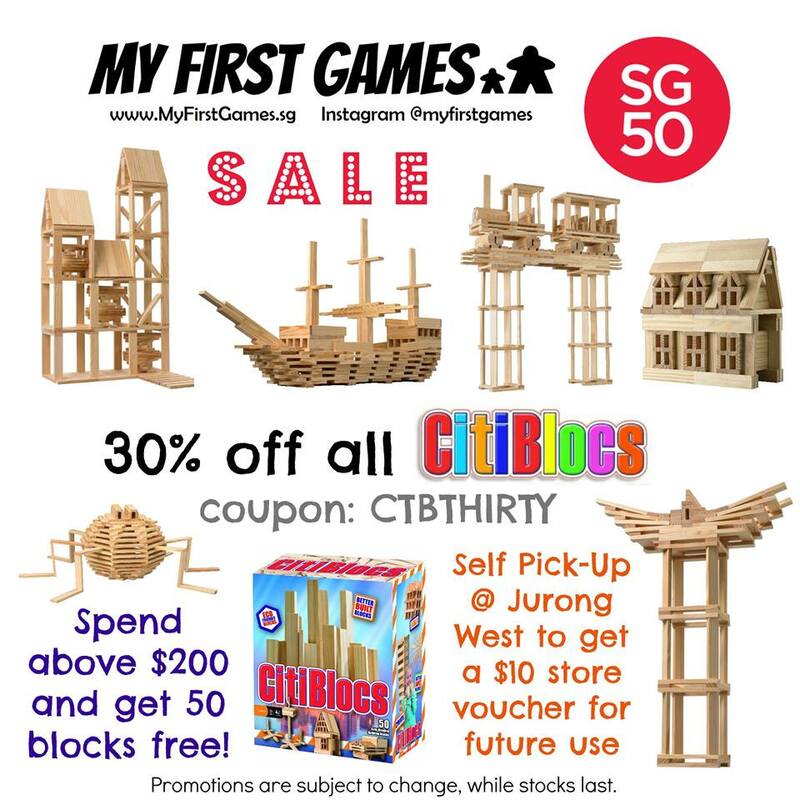 This event takes place on 31 Oct 2015 (Saturday) from 10am-1130am at the Learning Gallery in the Asian Civilisations Museum. The second workshop, A Little Bit Lost, is aimed at children between 4-6 years old and is a hands-on handicraft workshop where Christ Haughton will guide kids in the art of illustration, using characters from his book, A Bit Lost. This parent-child event will be held on 1st Nov 2015 (Sunday) from 11am-12noon at the Learning Gallery in the Asian Civilisations Museum. Tickets to both events are a trifling SGD$5 (cheap as free!) and are available through the Singapore Writers Festival website. They are selling out pretty fast, so be sure to book early! A little special something for Owls Well Readers: Singapore Writers Festival is kindly sponsoring a giveaway of one pair of tickets to Animation on a Phone and one pair of tickets to A Little Bit Lost! Thanks guys! Update: This giveaway is now closed and the winners have been emailed – thanks for playing! We’re guest posting over at Getgo Parents today, sharing an old recipe for non-lethal cupcakes. 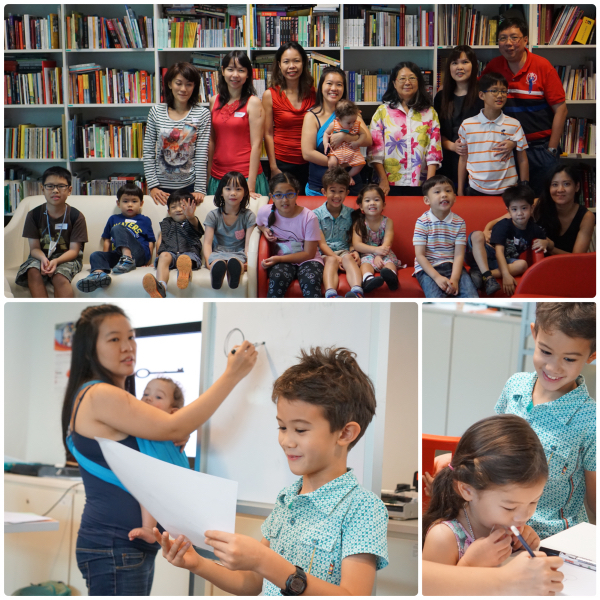 This past weekend, we were invited to a sneak preview of one of the many family-friendly workshops organised by the Singapore Writers Festival! 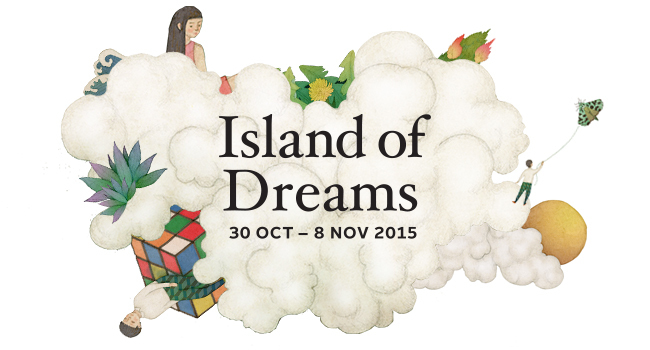 This year, the Singapore Writers Festival, which will be taking place from 30th Oct – 8 Nov 2015 will be catering not only for serious aspiring writers but for all ages with an incredible line up of free and ticketed events with the theme ‘Island of Dreams’. SWF3 (or rather, SWF For Families) has a whopping 51 programmes spanning a wide range of topics from storytelling to illustration to music to creative writing workshops catering to the different age ranges. 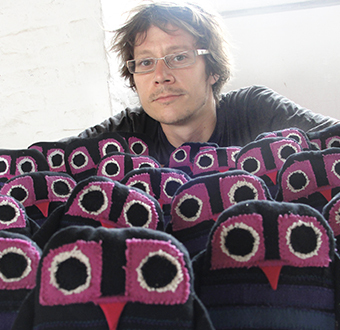 Some of the workshops for children will be run by award winning international authors such as Chris Haughton (who just so happens to be the author of one of Little E’s favourite books, A Bit Lost.) and local authors such as Lianne Ong, whilst others will cater to special needs children with dyslexia and visual impairment. We were very privileged to attend a creative storytelling workshop, ‘Cut, Shake, Roll’, run by professional storyteller-guide, Chuah Ai Lin. 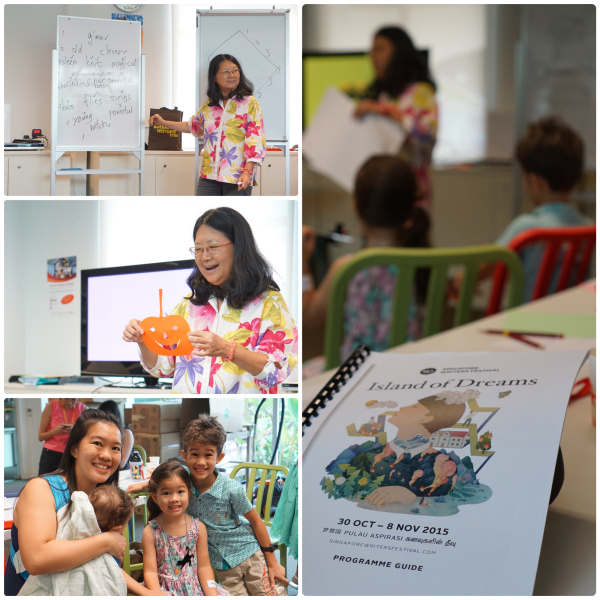 During the workshop, Ms Chuah showed us several different ways that we can encourage and work together with our children in order to tap into their imagination and create stories together. She started out by showing us how to brainstorm for story ingredients, randomly combining words to create a platform from which children can begin crafting their stories. Afterwards, she showed us how to use paper-cutting and tear-and-tell techniques in storytelling. J and Little E were spellbound by her stories, and she was able to gently encourage all the kids present to participate in discussion and build on each other’s ideas. We also broke into our own little groups to craft stories, with J and Little E each coming up with their own simple tales with some guidance from yours truly. Ai Lin was able to create such a safe environment, that J felt comfortable enough to do a little bit of storytelling in front of the group! I thought that was pretty awesome. 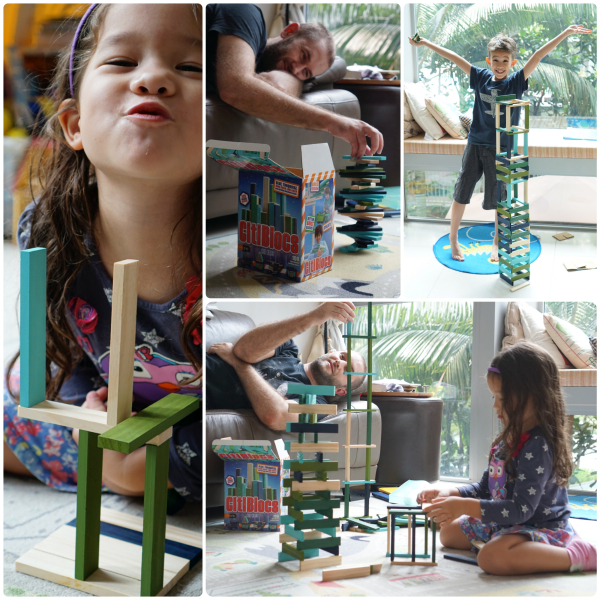 So, if you’re wondering what to do with the kids over the next few weekends (especially now during these hazy days), or you have a love for all things literary, take part in the shenanigans over at the Singapore Writers Festival! I’m planning to be there and I hope to listen in on some panel discussions and bring the kids to meet some popular kid’s authors! It’s Travel Thursday over at Owl Fly Away where we recount our first day at the Great Smoky Mountain National Park! 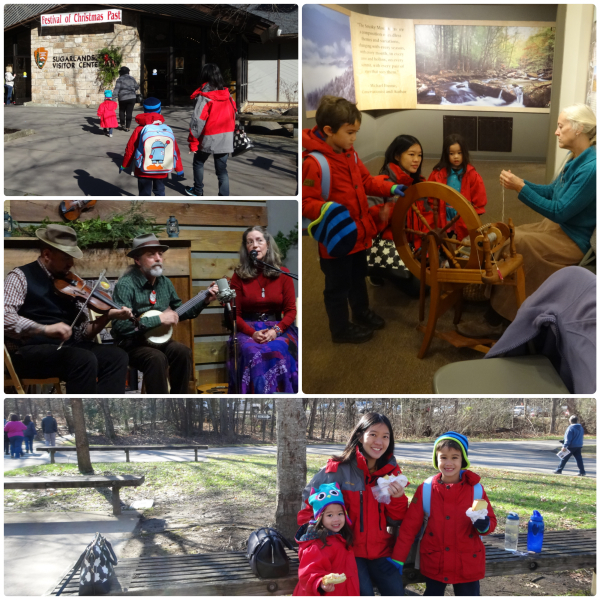 We were very fortunate that the first day of our visit to the Great Smoky Mountains National Park just happened to coincide with the Festival of Christmas Past, an annual celebration of Smoky Mountain culture! This took place at the Sugarlands Visitor Centre, where there were activities and demonstrations for us to enjoy all day long – and admission to everything was free! What a treat! We started off the day by learning about traditional methods of weaving and spinning with the children trying their hand at carding wool and spinning yarn, and there was even a toy maker who taught J and Little E to make simple spinners from a wood-whittled button and string.